A subtle breeze wafts through the earth, redolent of damp, dead bark from snowfall the night before as chef Aksel Theikuhl takes note of his subject: the winter woods of upstate New York. Here, there’s no sound of car horns; no aroma of perfume or that deceivingly-tasty roasted nuts stand; no appearance of ostentatious street art with outfits to match. Here, the metronome keeps a slower tempo than the city. “When you spend time in the mountains, the meadows and river, it brings you a true perspective of now,” Theikuhl explains. Fine dining can feel as if it’s bursting at the seams with “concepts” aimed at fueling IG double-tapping, Netflix-subscribed gourmands. We’re tuned in, and balance life by tuning out. As an admitted practitioner of this, I set out to experience what I believe fellow diners are craving themselves: a meal that keeps screen time at bay and places a chance to take more time to escape and connect at the forefront. This desire also got me thinking; are we in an era where the notion of “fine dining" in the U.S. is making a shift towards creating the opportunity for diners unplug and get away, rather than pop in to see and be seen in posh dining rooms in cosmopolitan cities like New York, San Francisco, and Chicago? If so, it's overdue, as globally, this concept has been around since 1954 in the Relais & Châteaux properties prominently in Europe, but also present in regions from the Caribbean to Sri Lanka. 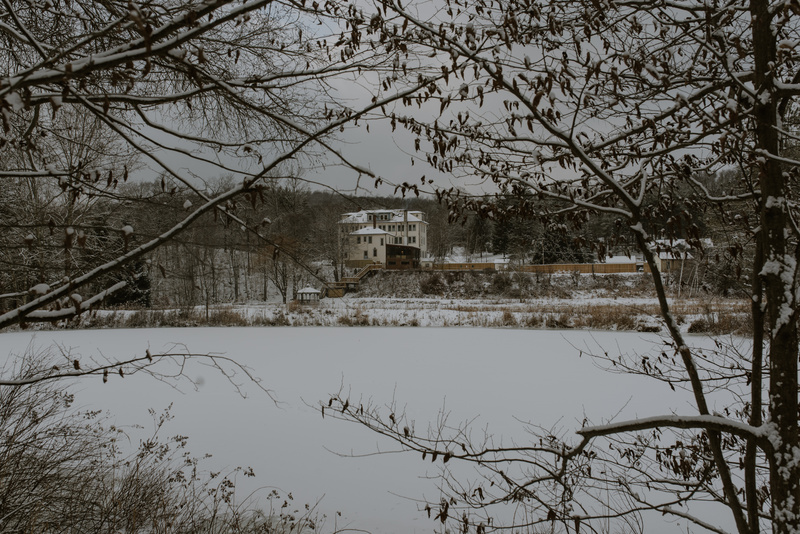 All this is what brings me to The DeBruce, a twenty-eight-seat restaurant located in upstate New York’s Livingston Manor, several hours outside of Manhattan. Like a handful of other notable restaurants that have opened in the last few years such as Healdsburg's Single Thread and the Relais & Châteaux themselves, it also houses a handful of lovely guest rooms to extend the experience into something more than a few hours spent at dinner. 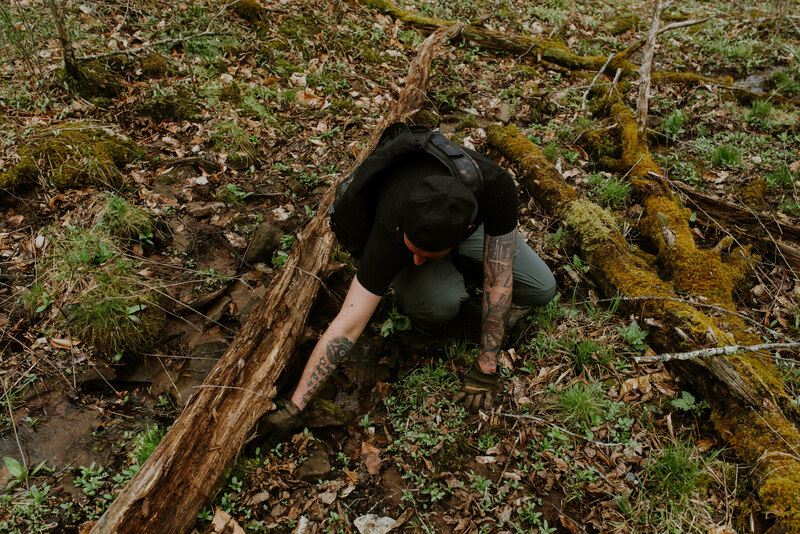 By the time he had gone through culinary school, a requisite Redzepi-fueled Nordic worship phase, and worked at Chicago’s BLT American Brasserie and STK Downtown in New York City, he found himself inspired by fellow NYC chefs like Devon Gilroy, Zak Pelaccio, and Annie Wayte who were pioneering new spots outside of the city limits. 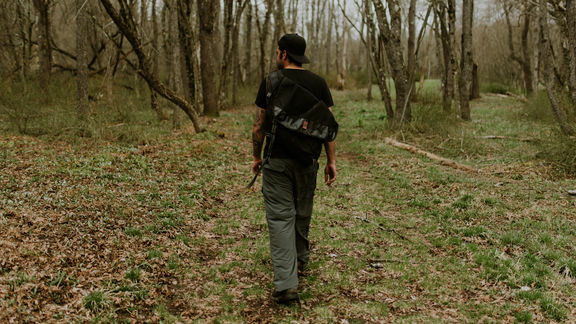 After searching for the idyllic “hundred-acre-woods” from which to forage daily provisions, Theikuhl joined Foster Supply as head chef at the spot that would become The DeBruce, an outpost nestled in the Willowemoc Valley. It’s winter and a light snowfall dusts the steps of the congenial restaurant. Theikuhl explains that this is the one season where foraging is minimal. 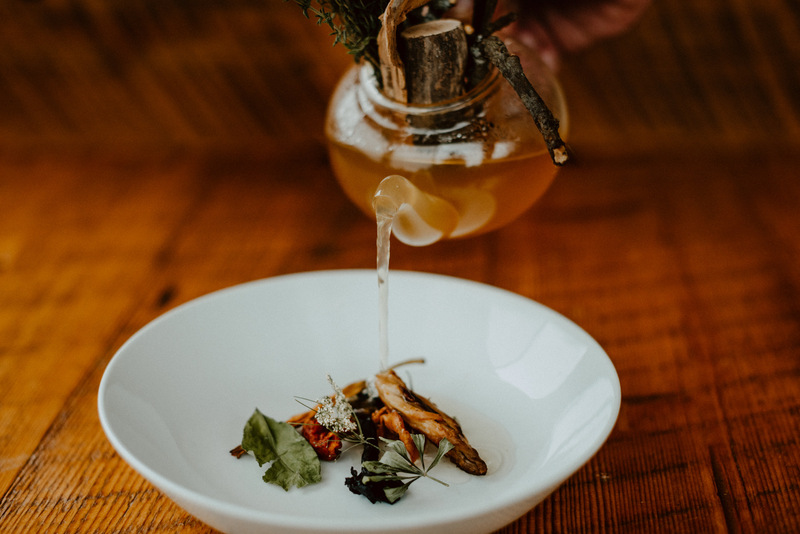 As such, pickled and fermented bits that were picked at the height of their seasons—chanterelle, milkweed pod, red pepper, and radish—now serve as menu staples. A seasonal interpretation of bread service brings a pull-apart dinner roll topped with salt made from bush berries foraged in the spring that add subtle pine notes and texture to each buttery bite. Then comes a generously-sized Belon oyster served with preserved husk cherry, rose, snail caviar, and dehydrated moss. When Theikulh comes to our table to present the next dish, I experience a hypersensitivity similar to that of Robert Downey Jr.’s Sherlock Holmes. Theikulh starts to tell the story of Jennie Grossinger, a hotelier and quintessential hostess in the Catskills of the 1900s, as he makes a rendition of her famed chopped liver, tableside. The urge to grab my phone doesn’t exist here. My eyes dart from the bright yellow of the diced hard-cooked egg yolks to the mime-like hand gestures that stir all the parts to make the whole, all while being part of a chorus of fellow diners who are just as present as I am. I salivate as the mixture is piled onto toasted sourdough with a generous serving of apple butter. The calm resonates from the first bite to the last. Closing the meal with a café au lait and a maple tart for dessert, I couldn’t help but think of rural locales like Low Gap, Arkansas; Ladora, Iowa; Paducah, Kentucky, that house gems of gastronomy sans the expected catchphrases. The final sips brought me to the satisfying conclusion that the transformation of fine dining into a space outside of the expected coordinates brought me the, diner, the biggest luxury of all: a chance to be present and (even!) stay the night to bask in the experience instead of diving headfirst into the subway to rush home. Call ahead and make a reservation to enjoy one of The DeBruce’s tasting menus. 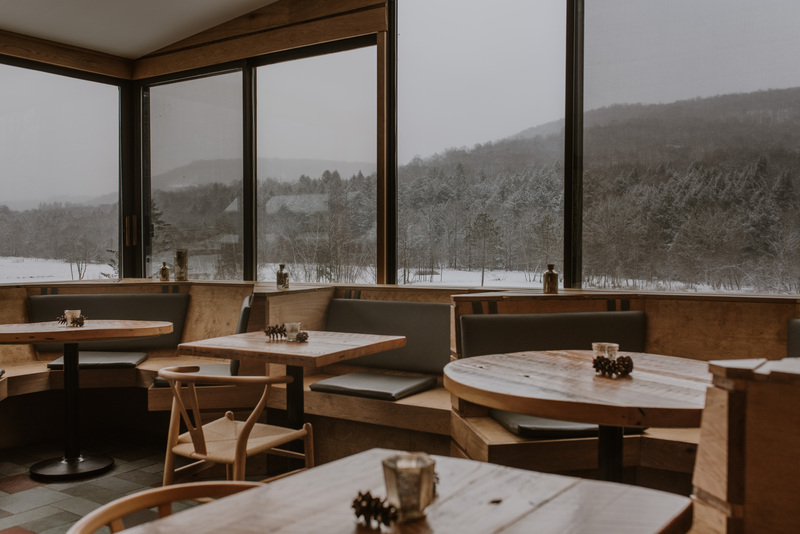 If possible, request to sit in the corner elevated booth–while you wait for dinner, you'll be able to take in the sights of the mountain and valleys thanks to the restaurant’s glass walls. If you plan to drink, don't miss the New York State wine offerings to wrap up the hyper-local experience. 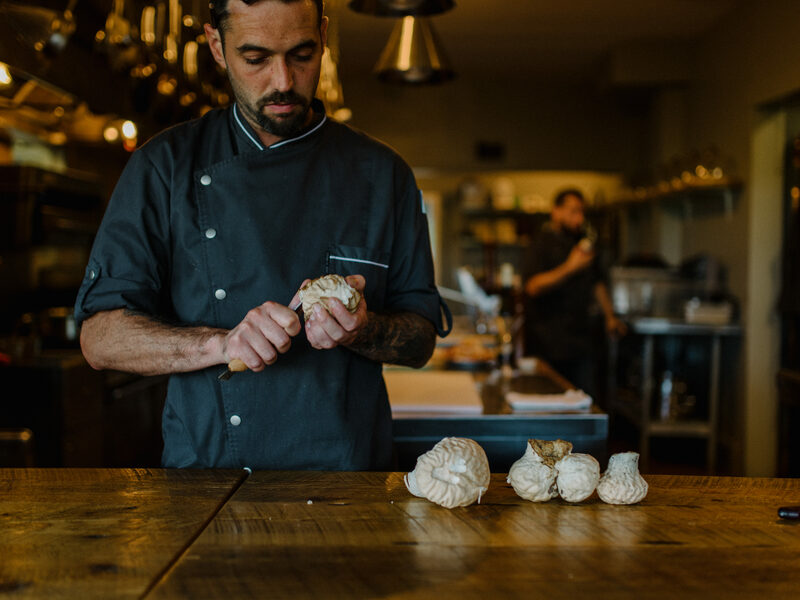 Chef Zakary Pelaccio talks about his life and career as a chef including finding inspiration in the flavors of Malaysia, opening Fatty Crab, and leaving New York City to open his new restaurant Fish & Game in the Hudson Valley. Roots takes a deep biographical look into the world's most influential chefs to reveal their inspirations. Ancestry.com style except not really.